Over the years Christopher has spontaneously delivered many dozens of unforgettable lines. Here are four of them. Is Donald Trump a plutocrat in populist's clothing? Martin Amis defends rational thought over anti-intellectualism—which might just be the greatest con in American politics. There is no substitute for thinking—although modern-day America may have you believing otherwise. Novelist Martin Amis attributes the recent surge in anti-intellectualism to the populist politics sweeping the United States. "Populism relies on a sentimental and, in fact, very old-fashioned view that the uneducated population knows better in its instincts than the over-refined elite. That leads to anti-intellectualism, which is self-destructive for everyone." The rejection of rationality and analysis is something politicians can easily capitalize on, and Amis refers to President Trump as a plutocrat in populist's clothing. "It’s profoundly hypocritical because his policies do not favor the working man... It’s an act, populism. Always an act." Are the American people being conned, and is a return to elitism the answer? Martin Amis is the author of The Rub of Time: Bellow, Nabokov, Hitchens, Travolta, Trump: Essays and Reportage, 1994-2017. Martin Amis explains why the biggest challenge of free speech is learning to use it responsibly. Freedom of speech is absolute, says novelist Martin Amis, and as such it must be defended absolutely—even when you don't agree with it. Free speech is what keeps democracies from descending into totalitarian states, but how you exercise your right is as important as having it. "I feel nothing but unease when it’s done lightly... You have to be able to back it up. So I would urge civilized standards of moderation on both sides," says Amis, who admits he's a fan of political correctness—although he's clear to discount the extreme policing of outer-fringe PC culture. Free speech and political correctness are not mutually exclusive, as many presume, and Amis argues that being PC is actually a responsible use of that freedom. Do we really want to just "get away" with saying things, or do we want to raise the standard of discourse? Saying something repugnant without much thought or consideration may not have legal consequences, but there are social ones. 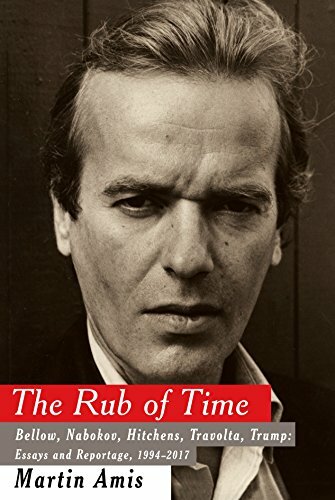 Martin Amis' latest book is a collection of essays entitled The Rub of Time: Bellow, Nabokov, Hitchens, Travolta, Trump: Essays and Reportage, 1994-2017.